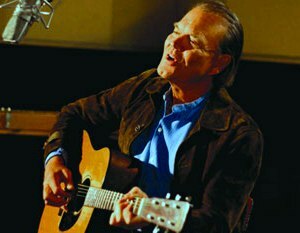 “Rhinestone Cowboy” singer Glen Campbell talks he is in the early stages of Alzheimer’s disease, and has recorded one last album as a farewell to his fans. Glen Campbell is giving ABC News his first TV interview since being diagnosed with Alzheimer’s disease. Campbell, 75, had been suffering from memory loss for years, but the Alzheimer’s diagnosis only came six months ago. Glen Campbell is opening up about being diagnosed with Alzheimer’s disease, something that certainly has not robbed the legendary performer of his sense of humor. Alzheimer’s Disease is slowly stripping away the memories and abilities that define one of music’s greats. But day to day, surrounded by his family and friends, encouraged to play his guitar and sing and joke, the 75-year-old Campbell is often smiling. The doctors also don’t know how the disease was developed. Alzheimer’s disease is characterized by gradual loss of thinking power, and eventually can become a total mental disability. The early symptoms of Alzheimer’s is easy to forget the things that are often done and new things. Sufferers also experience disorientation of time and trouble of complex cognitive functions such as mathematics or organizational activity.